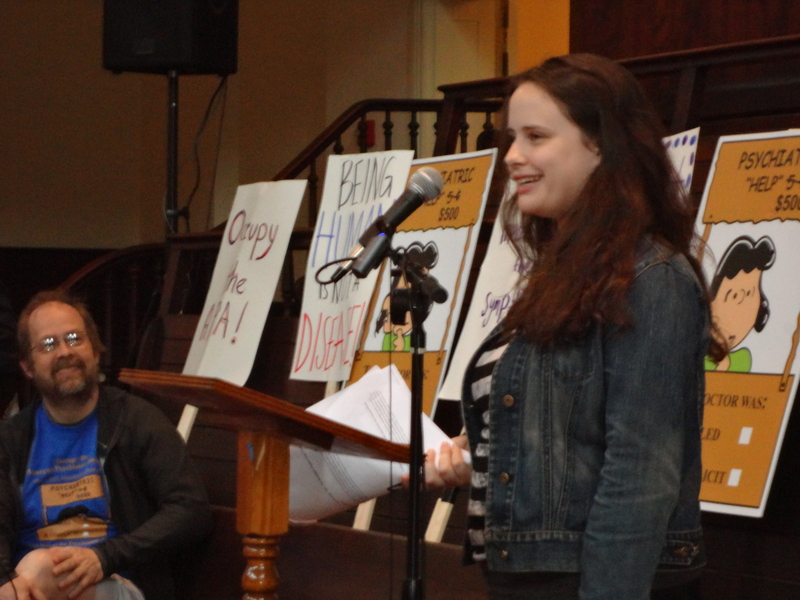 Connecticut college student and monitor of the event, Caitlin Belforti, speaking at the Friends Center in Philadelphia. 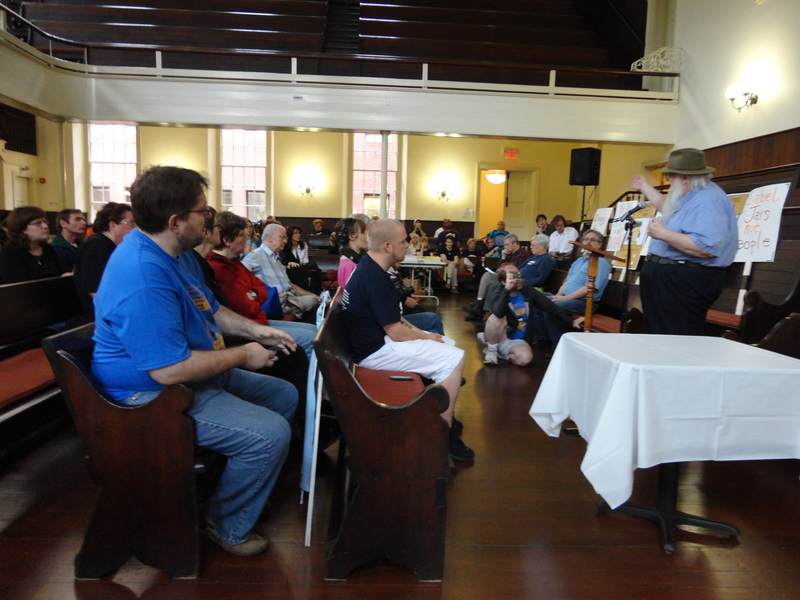 New York activist Daniel Hazen speaking. 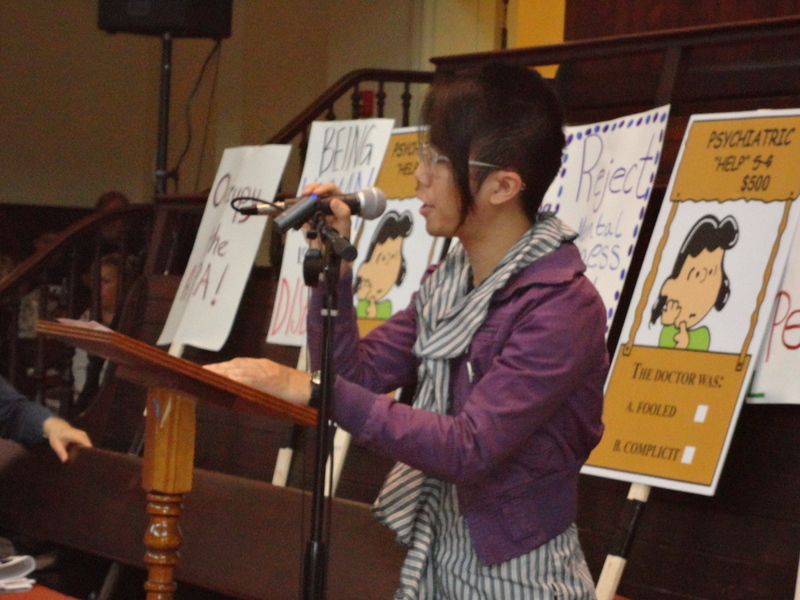 Aki Imai is from Ohio. He launched the Our Life After Labels submission-based blog. 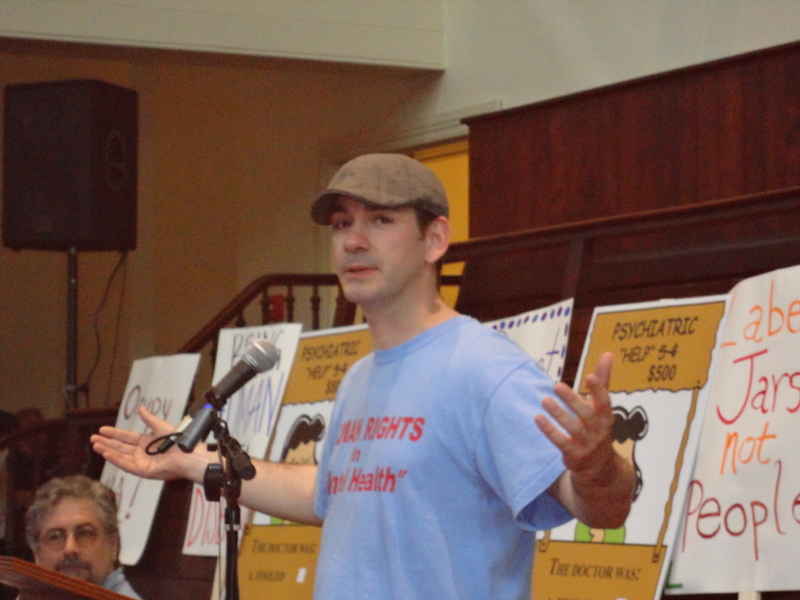 Joe Rogers, a Philly local, is the director of the National Mental Health Self-help Clearinghouse. 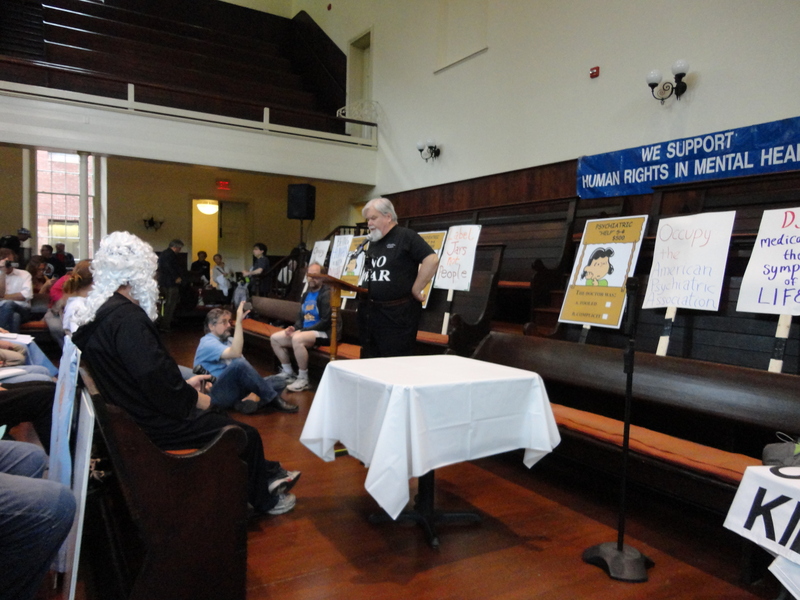 John Judge read a statement of support from Paula J. Caplan who was unable to attend. 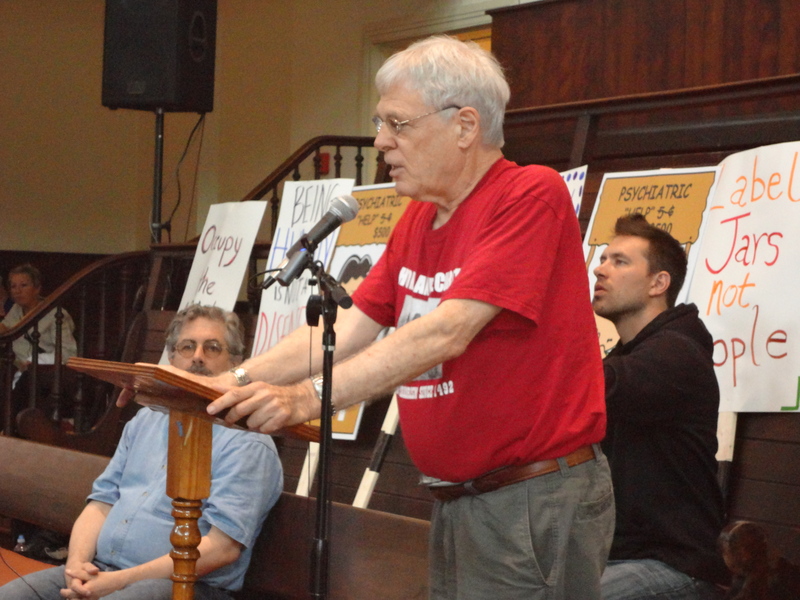 Long time San Francisco activist and retired attorney Ted Chabasinski. The backdrop for the mornings events. 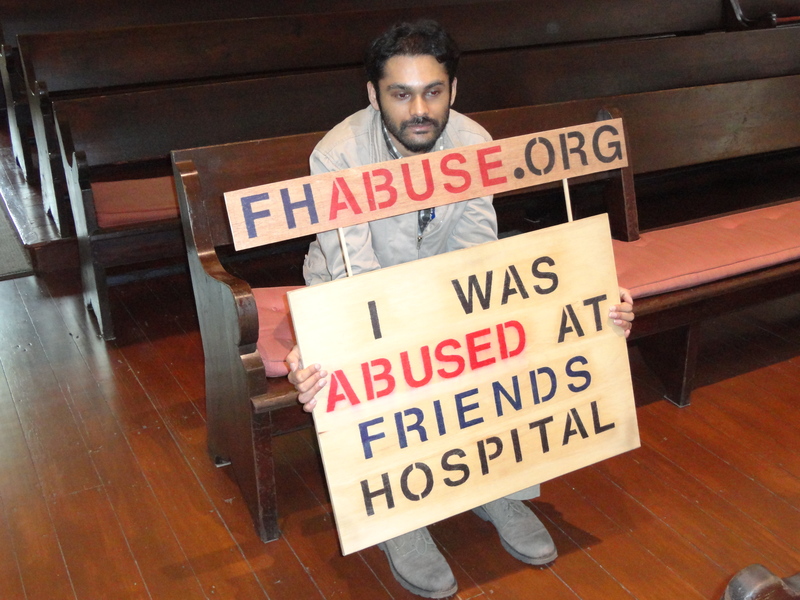 Godly Mathew once spent one hundred consecutive days protesting against psychiatric abuse outside Philadelphia’s Friends Hospital. Down with psychiatric labels. Up with human beings. 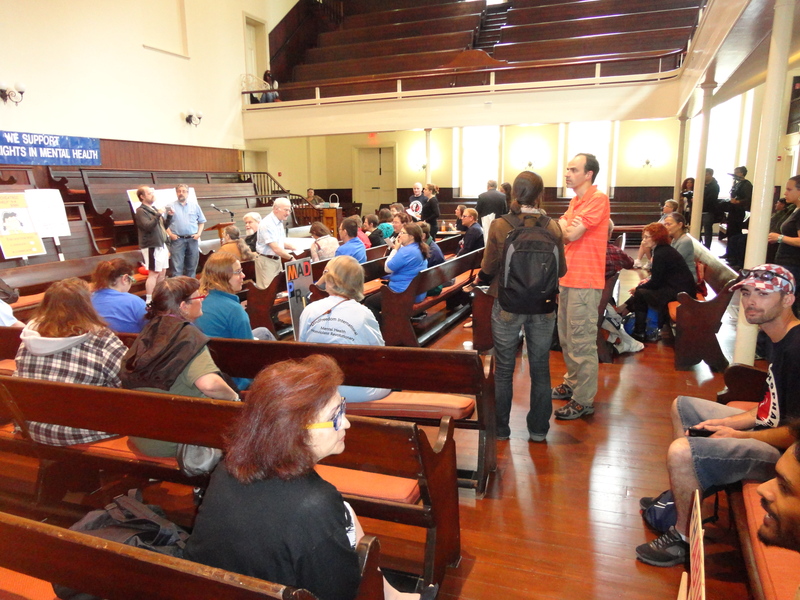 Inside the Friends Center events get underway. 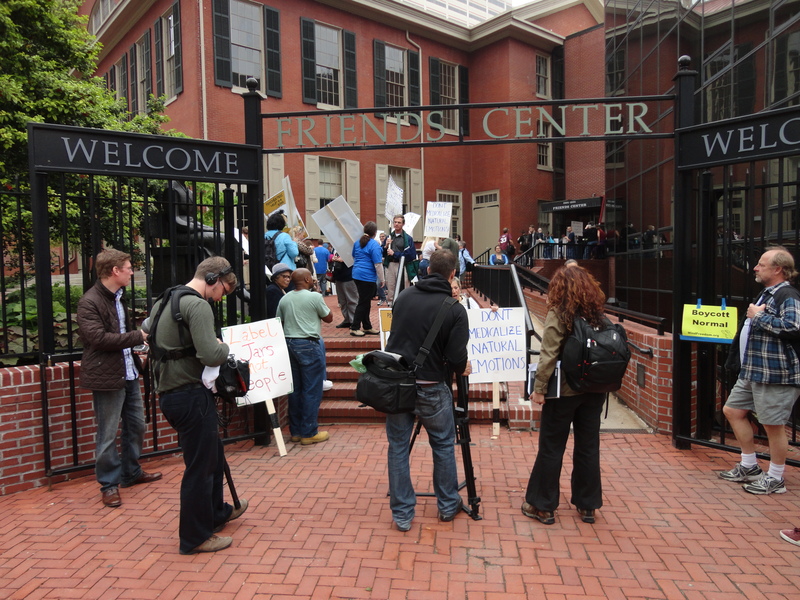 Outside of the Friends Center where the rally took place. The march to the Convention Center minutes away. 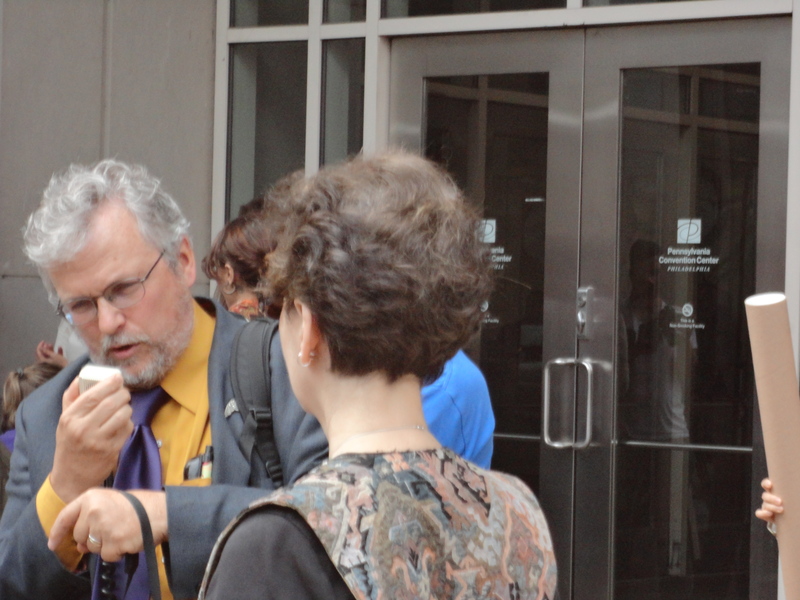 Director of the Anchorage Alaska based Center for Psychiatric Rights lawyer Jim Gottstein. 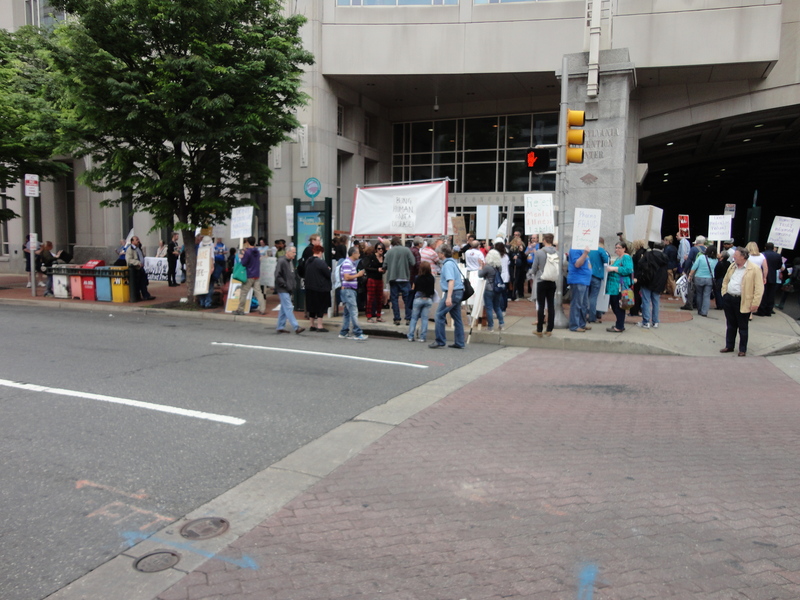 The demonstration outside of the Convention Center. 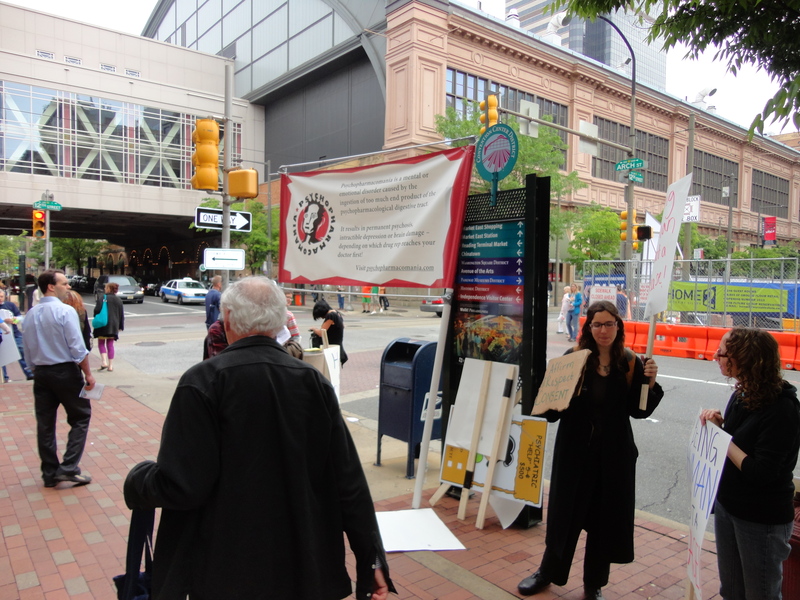 Protesters outside of the Convention Center. 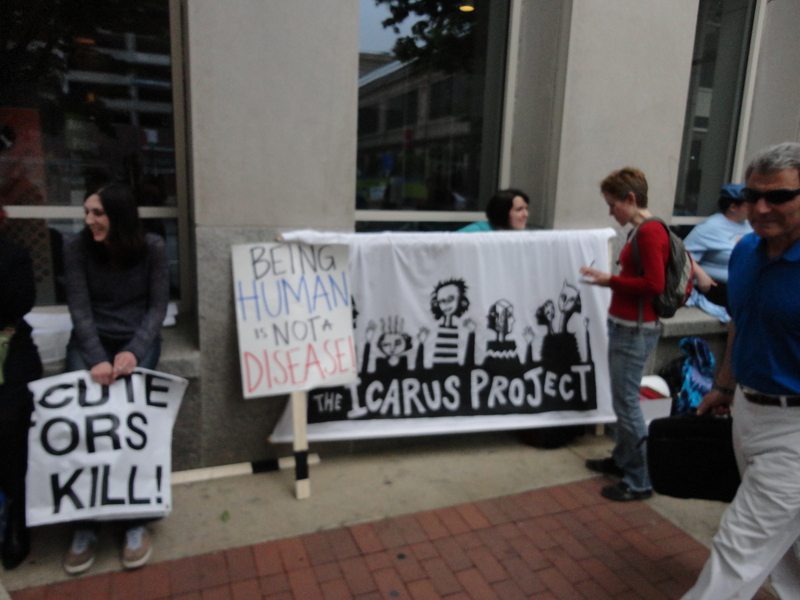 The Icarus Project well represented. The shrinks label bible, in revision, and its discontents. 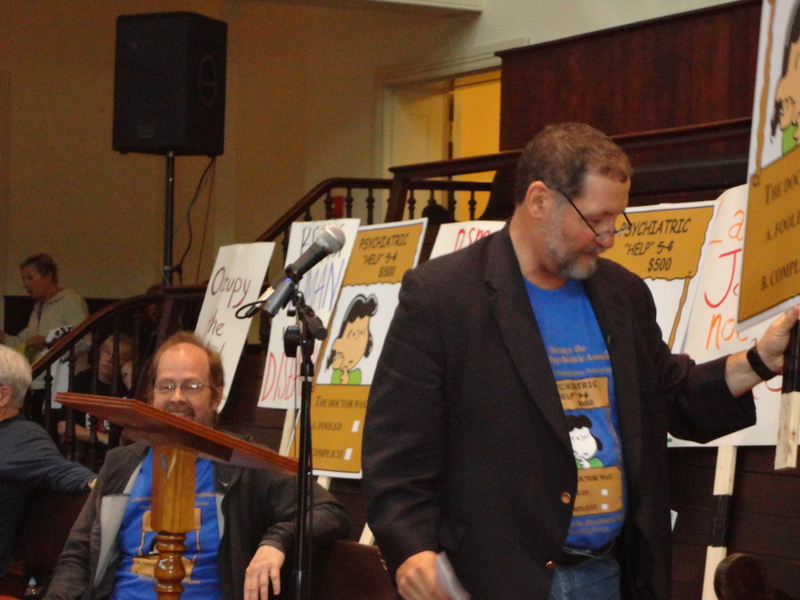 David Oaks, director of MindFreedom International, at the microphone beside Philadelphia native Susan Rogers. Amid other not so spontaneous eruptions of Mad Pride! Great photos. Thanks. I saw I great video on Jim’s youtube channel of you walking down the street as a group and you specifically changing the chant… brought a tear to my eye. Thanks, Ryan. I saw the same video, and nearly jumped out of my skin. I will have to remember to tuck both sides of my shirt tails in the next time I’m in a march. Jim has uploaded many of the speeches that took place at the rally to his You Tube channel, and I must say that some of them are really worth a viewing. Your welcome, markps2. 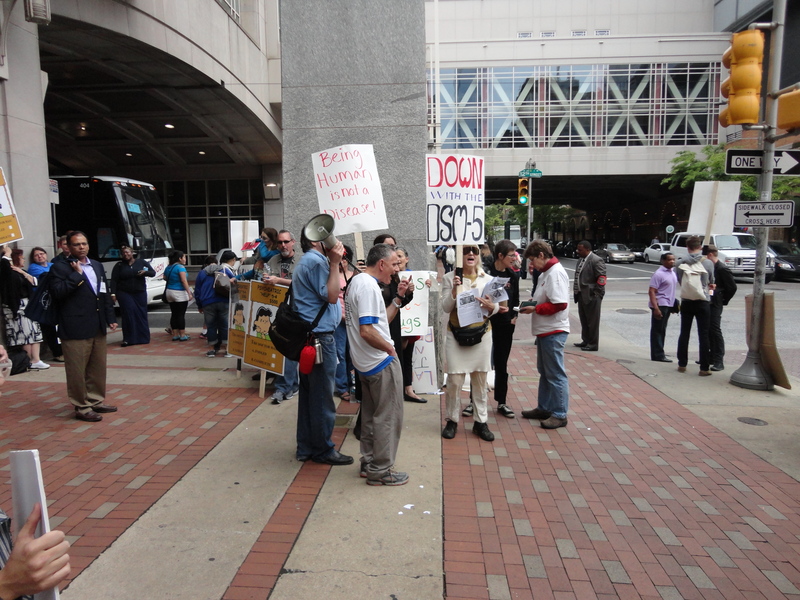 There is already talk of another protest to take place at the APA’s next convention set for 2013 in San Francisco. I’ve heard the APA may release the fully revised edition of the DSM while this convention is going on. Hopefully I can be there, and bring back even more photos. I will be guesting with Susan Rogers a segment of the MindFreedom International Free Web Radio on the protest this Saturday, May 12, 2012, at 2 PM ET. The show will be hosted by MindFreedom International board president Celia Brown. I invite anyone who is interested to catch the show, and if you feel like it, to call in with a comment or a question. Love this, MFV and wish you all the success possible in bringing change wherever you go! Btw, was just with Susan at a BRSS TACS Policy Academy where she presented and spoke briefly with her before she went on, but something she said to the group still resonates; “kickass advocacy!” You’re clearly doing that in spades and its appreciated in circles you may not even be aware of! Thanks! I am going to a E.C.T. protest on the 12th of May, so I can’t call in at 2pm, sorry. It is nice to see some photos of everyone; all looking unsurprisingly sane, of course(!) Please send me a link to jim’s youtube channel. I couldn’t imagine a better reason for missing the show, markps2. I hope your demonstration goes well. Hi, markps2. You have to see this if you haven’t already re. your ECT protest. It is a film of the torture of a boy in the Judge Rotenberg Center in Massachusetts and is unpleasant to watch and to hear. Note how the staff are ready for action when they ask him to take off his jacket. It is a set up. There is no reason to ask him to take of his jacket; if he wants to wear it, then so what? The only reason appears to me to be in order to provoke a response that will provide (in their minds) an excuse for the torture that follows. See how he hunches in fear and how he reacts when the man touches him; in pure terror. He is not aggressive; he tries to escape from their clutches by sliding under the desk, screaming. He knows what is coming because they have done it before. GM forrest I’ve read other comments where you support forced psychiatry. Rather than focus on the terror of this kid at the Judge Rotenberg center, how about supporting human rights for everybody. You would see the same reactions of terror if you were to see videos from all forced psychiatry institutions. Your toes are half in the water GM Forrest. Don’t just focus on the kids being tortured. Adults are being tortured too. Hey, Kello. You could not be more wrong. Show me what you think is support of forced treatment and I will show you the driest toes you could imagine. Or wettest – whichever way you see it. I was a bit the worse for wear the other night so I am posting here again for Kello’s and anybody else’s benefit who may have misunderstood me. “Wettest”, btw! I am not in favour of forced treatment. I have seen it kill. I was of the understanding that all of us who follows this blog are against it. I am in favour of extending the right not to be treated to all people, not just those treated for supposed mental health conditions. Forced treatment is endemic in the medical field. I am in favour of finding answers. Genetics and epigenetics may provide helpful information. I hope that modern day psychiatry will be debunked as a result of advances in brain mapping. Findings are going to be produced regardless, so I think focusing on steering the science in a beneficial direction is important. I am in favour of defining a mental or emotional emergency that requires treatment in the same way as a physical wound does. This is a grey area. If it appears contradictory to suggest that there is an argument for intervention in an emergency, it only highlights how important it is to redefine an emergency. Approaching a person who is experiencing emotions or brain activity that is out of their own control with the desire and function to control and contain that person by force is a mistake. This approach will escalate a person’s central nervous system responses because it represents danger. A person is expected to submit to the source of threat and they cannot do this in a heightened state. This is why so many people are killed or imprisoned for fighting or shot for running away. Only those who are able to keep still stand a chance. Talking people down is the correct method to apply. People who are skilled in this are only brought in when there is a siege or someone is standing on the edge of a building. These skills should be taught to every police officer as a matter of course, to be employed in any situation where a suspect is exhibiting high levels of agitation. Every doctor and nurse ought to be able to employ these skills. Assistance to wellness should be the goal, not the forced control of the symptoms or behaviour of the patient and therefore the patient. I am in favour of the decriminalisation of behaviour that is considered unacceptable in social terms when it is the product of mental or emotional distress. Another grey area. Defining whether a person ought to be arrested and sent to jail or taken to hospital is a tough one. US mental hospitals appear to be no better than jail so you would probably argue that to favour hospital is no better than to favour jail. This is not the case. This is where emergency respite centers would be a good thing. A couple of days in a warm and caring environment does wonders for most people. A move towards rehabilitation rather than punishment is necessary. Violence towards others is a tough one because the perpetrator might feel that he is being attacked and therefore is defending himself. This is a candidate for incarceration but I do not necessarily believe he is a candidate for jail or prison. However, when you put someone like this in a mental hospital, he will likely be in the same place as someone who has been committed for wandering in the street in his pajamas. I do not think that these two people belong in the same place. I think people have the right to wander in the street in their pajamas. If this person were to desire help, then it ought to be given; it should not be forced upon him. But then we have to consider the impact of his behaviour upon his loved ones. If he is putting himself in danger, there is an argument for supervision. Another grey area. I am looking for solutions to the grey areas. It is easy to argue black and white but that does not provide us with workable solutions that can be implemented. Solutions can be implemented. Polemic cannot. The system needs to be tiered and compartmentalised in order to achieve progress. Changing laws to benefit the vulnerable and converting the existing infrastructure are first steps. I do not think that there is a defence in any event for forcing ECT upon someone. You can see in the film that it is being used as punishment. To do this to a person is assault. The same is true of injecting people against their will. More and better trained staff are needed to actually help people rather than to turn them into zombies with one-size-fits-all medication. Pharmaceutical companies must be reined in and doctors must be educated away from relying upon drugs for treatment purposes. Payments to doctors from pharmaceutical companies must be banned. Conflict of interest in the APA must be banned. The DSM should be treated as being as speculative a book as any other on psychiatry. 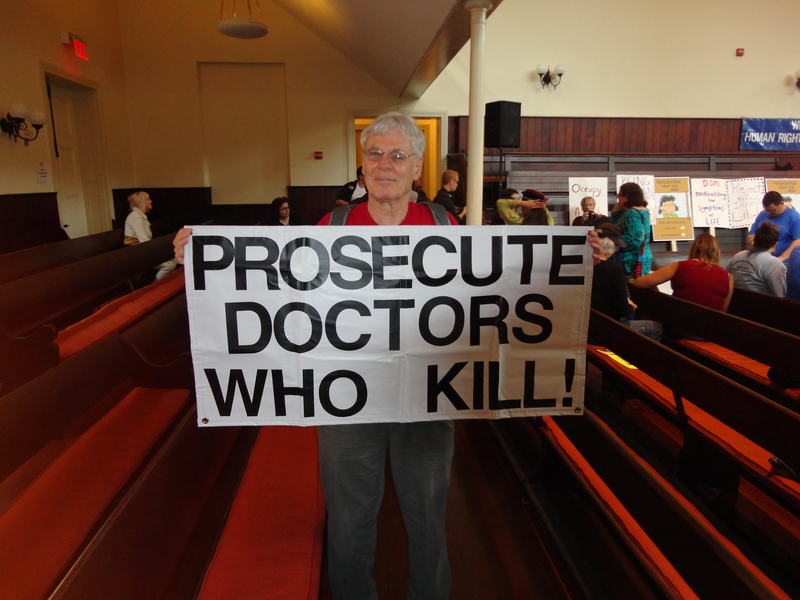 Doctors must be held to higher levels of accountability. Some of the more obvious injustices can be met head on. When it comes to treatment, I am looking for the answers that provide relief without coercion. I don’t see that we can get a “both and” answer out of this matter, G M. You speak of “black and white” and “grey areas”. The issue of force must really have an “either or” answer. Either you are for it, or you are against it. “Both and” is FOR forced treatment. Force is a “black and white” “either or” matter. Genetics and epigenetic concessions to medical model quackery let the prospect of force in through the side door. Most of these DNA based studies are actually being conducted in order to support the bilion dollar pharmaceutical industry. When people are denied the right to refuse treatment, pharmaceutical companies have a captive clientelle, and their business does better. Forced drugging is forced treatment. This kind of research is worse than tainted, it’s completely biased. In a situation like this one the issue is “black and white”. There is no room for a “grey area”. Either you are for force, or you are against it. Should you allow instances where you think force is necessary, then you are for it. I wasn’t asking about any such instances, and yet you seem obliquely to allude to the possibility. It’s not a complex question, and it doesn’t require a complex answer. I was actually enlarging upon my earlier response to Kello but there was no reply button. Research into genetics and epigenetics is going to happen. Steering it in a beneficial direction is what is important. I am against forced treatment in the context in which you normally present it here. Overall, however, I do not concur that we are talking about a black and white issue. Take a child who needs life saving treatment of any kind. The child refuses the treatment. What do you do? At what point do you consider a person old enough to decide for themselves? What parent would say, “All right, let my kid die.”?These are grey areas. I am not obliquely “alluding to the possibility” of forced treatment, I am saying that there are times when it is necessary to save someone’s life. My view is that it should be applied only in an emergency. When it comes to a psychiatric emergency, the definition of such an emergency needs to be clear in that it is only ever considered an emergency if a person is in immediate danger of death or severe injury. For instance, if someone is experiencing paranoid hallucinations and they have high blood pressure or tachychardia, there is an argument for giving a sedative to reduce the possibility of them having a heart attack. I like to think that this could be administered through kind and gentle persuasion rather than force or threats. When that person is out of danger, any further treatment must be consensual. Now think about what happens when a patient refuses treatment on religious grounds. That wish is respected no matter the outcome. Pregnant women die and their children die along with them without essential blood transfusions. An adult who has capacity has the right to refuse any medical treatment. This is the position at common law and under the Medical Treatment Act 1988. Therefore an adult may refuse a blood transfusion, even in emergency circumstances. Where a person provides medical treatment (such as a blood transfusion) against the decision of an adult with capacity, that person has committed an assault. The assault may give rise to either criminal charges or to a civil action for battery.  To prevent suffering or continued suffering from significant pain or distress. So maybe we need something like this as insurance for all of us when it comes to refusing mental health treatment on any terms, emergency or otherwise. I can see that the issue will arise about a person’s “capacity” to decide but as we know that episodes of ill health are temporary for most people, there is a case for implementing a previously made decision about how one wants to be treated. Forced treatment is not a problem that only people caught up in the psychiatric system experience. Elderly people have the right to refuse their treatment but are not given it. Rules of consent go out of the window when people are at their most vulnerable and elderly people are often treated appallingly, particularly when they are suffering from any loss of mental faculty. Ensuring that the right to choose is respected is a huge challenge even when that right is considered to be in place. To say that considering these grey areas and looking for solutions that can be implemented across the board is the same thing as being pro-force is blinkered. The grey areas must be addressed if we are to effect positive change. We’ve got a saying that you ought to spend more time on, and that saying goes, Keep It Simple Stupid! Simplicity, going back to antiquity, has been regarded as a virtue. Complexity, as in your case, is a way of saying the opposite of what you say. We’ve got a word for saying the opposite of what you say, and that word is hypocracy. Whoa! Steady on there, now. Let me make it simple for you then, Stupid. If you leave the defining of an emergency to the people who are currently in control of the situation then things will never change. In order to effect positive change, you must be able to present a viable alternative to the way things are currently run. That means getting into the nitty gritty of areas you don’t want to admit demand attention. It is not pretty but it is necessary. When you deny this requirement, you are the one being hypocritical. What I am doing is looking for a simple answer to a complex matter whilst being realistic enough to realise that the answer is likely to be complicated by the people involved. It is important to push into a position of being heard and being taken seriously. That requires study and planning. Standing around with placards agreeing with each other about the damage the monolithic power machine has done to you is only going to get you so far. You have told me before that blogging is your thing. That is fine and I do not expect you to be the one to take on a role in study and planning, however to deny that this will be necessary is foolish. Okay, let me simplify things further. 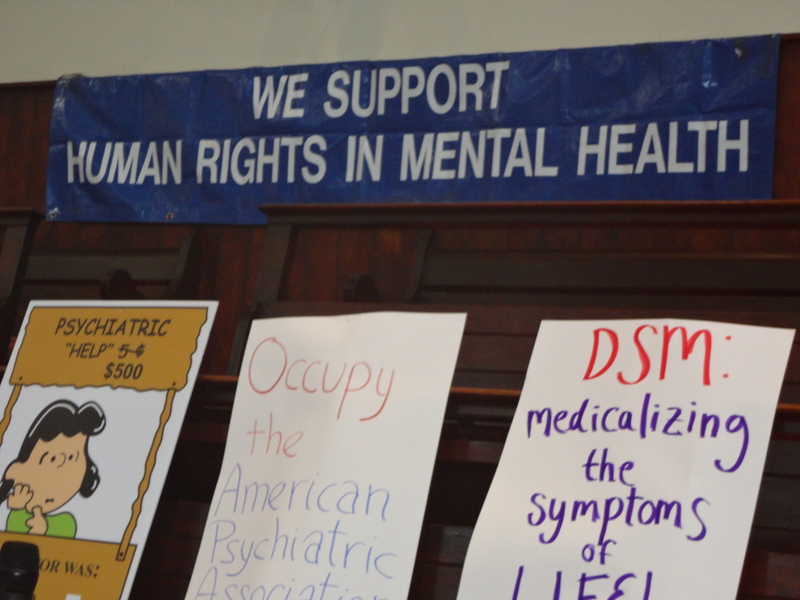 If we repeal mental health law treating people against their will and wishes becomes assault. This law is based on the legal definition of insanity. 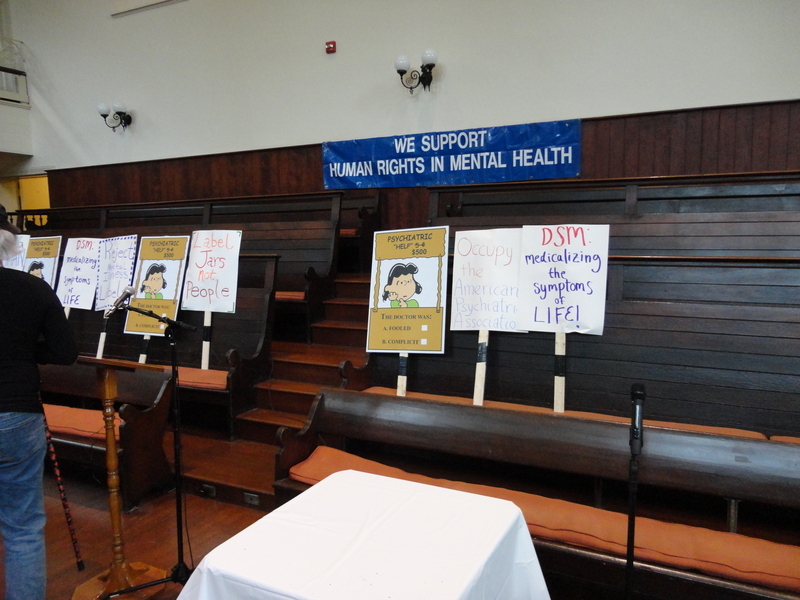 Once this law is repealed, the issue becomes a matter of how do we treat people who want to be treated for what are commonly referred to as mental health issues. There may need to be legislation enacted to achieve this aim, it’s just that legislation shouldn’t be another mental health law. You may be referring to threats of suicide as a cry for “help”. I think if you want to prevent suicide you create a more liveable world for everybody. There is a largely selfish component to threats of suicide, and we haven’t dealt with that one yet. A person has the right to take his or her life; it’s just failing to take one’s life, if one tries to do so, is guaranteed to get one a psychiatric label. Does this mean a person is “sick”? No. Absolutely not. Everybody has this right. It’s just not a legal right. Create a less liveable world, and what do you get? You get exactly what we’ve got now. You get rising levels of social distress, and you get a rising suicide rate. 1. A more humanly habitable planet. The first goal you reach by putting people over profits. The second goal you reach by repealing mental health laws. The two are actually related. As American founding father Patrick Henry once put it, “Give me liberty or give me death!” Lessen the liberty, and you are going to get more death. We agree more or less when it comes to idealism. Our disagreement arises from a lack of realism on your part when I broach the subject of practical solutions. I wasn’t specifically talking about suicide, I was actually thinking about paranoid hallucinations. Where suicide is concerned, it is hard to see that the world can be anything better. Suicidal feelings can arise as the result of illness as much as they can be a result of environment. They can be a result of both. Treatment helps some people recover. I, for one, do not want to consign those people to death and their families to sorrow. This is what I am talking about when I say that it is not so clear cut when it comes to an emergency. There are people who want treatment and are refused it. There are people who do not want treatment and are given it. There are people who need treatment but are too scared of being locked up or pushed around to seek it. There are people who discharge themselves because of the behaviour of staff towards them. It is a mess. Death or serious self-harm can result from any of these permutations. In the case of hallucinations, a warm caring environment is not just advisable, it is an absolute necessity. Again, the definition of an emergency comes into question. Have you ever had a hallucination? There are a number of causes, such as illness – hyperthyroidism, schizophrenia (when you believe it exists), diabetes, head injury, brain cancer – lack of sleep, dehydration, malnourishment, alcohol, medication, and illegal drugs. A person who is having a bad hallucination can be in danger of harming themselves or others. To me, this constitutes an emergency. It is an emergency that might just require a kind face and overnight monitoring. But it might further require a sedative or other medication, fluids via a drip, a heart monitor, and so on. And it should not be the case that people suffering from grief or acute mental and emotional distress of any nature are turned away because they are not (yet) suicidal or because they are drunk. This is where the respite centres come in. It makes no sense for you to deny the existence of emergencies or to think that there will never be incidences where people temporarily lose the ability to be actively involved in decision making about their care. So defining an emergency is key. An actual emergency is not a “paranoid hallucination”! I know the difference between an hallucination and an actual fact. Do you? There is such a thing as making a mountain out of a molehill. Some people go to the emergency room of hospitals because they have done so. There is also such a thing as a life threatening situation. Go to the emergency room over a molehill three or so times, and you will get to know the inside of psychiatric institution intimately. The answer is inside you, not outside you, G. M. Demanding too much of the world is only asking for trouble. I’m not saying trouble is a bad thing, necessarily, but that kind of trouble is a bad thing. The idea is to get a grip on how much is too much. I note that you only comment on hallucinations here and skirt around the other examples of emergencies I have given. A paranoid hallucination can certainly turn into an emergency. If a person does not know they are hallucinating, what they see, hear, touch, taste, or smell is reality. Even when they do know they are hallucinating, the effects can take their toll. Thoughts become reality and if they take a negative turn, there is no limit to the devastation that a person can wreak upon themselves or others. Some hallucinations can be lived with and doing so ought to be the choice of the individual. But the bad ones can certainly constitute emergencies. A person who begins to hallucinate and is detached from reality should get checked by a health care professional right away. Many medical and psychiatric conditions that can cause hallucinations may quickly become emergencies. A person who begins to hallucinate may become nervous, paranoid, and frightened, and should not be left alone. The answer to what, exactly? In what context? I think you are expecting too much of the world that it suddenly morphs into your Utopian ideal. It would be great if it did but we have what we have for now and we have to work with that. If you mean that expecting emergency help for hallucinations is expecting too much, I disagree. I believe it to be a reasonable expectation. Many illnesses produce hallucinations and a person must be examined to determine the cause. Do you mean the kind of trouble you get by going to emergency with hallucinations? How much of what is too much? You are being a bit cryptic, so please explain more clearly what you are talking about. I see no need to get long winded. I think we can easily agree to disagree. The big complaint in the mental health field, when it comes to hallucinations, has always been about hearing voices, or so-called audio hallucinations. There is now a Hearing Voices Network for people who hear such voices. According to this Hearing Voices Network a certain percentage of the population always heard voices. It is not so unusual or “pathological” after all. This Network helps people deal with those voices by connecting them with other voice hearers. What can be wrong with that? When you have a molehill, and you think you have a mountain, that’s too much hot air. I simply asked you to explain your mysterious remarks. It is not exactly clear what we agreeing to disagree upon. One presumes it is hallucinations. I am led to believe by your comments that you have not experienced one or have perhaps experienced a mild form at most. Failure to treat people experiencing hallucinations appropriately is rife in the medical profession and in law enforcement. I would go so far as to say that a specialist in hallucinations ought to be dispatched to all potential cases such is the depth of misunderstanding. There is absolutely nothing wrong with the Hearing Voices Network; it is a positive approach to enable people to live with the voices rather than having them take drugs. I do not believe it to be a medical condition in and of itself. That conclusion would be more to do with what the voices say and how an individual reacts. Did you really look at the link about the man chewing another man’s face off and deem it to be a molehill? Please. Major religions are based upon hallucinatory experiences. Religious figures are known for them. Near death experiences may well be explained by them; some of the greatest music and art definitely is. Hallucinations are Everest and an iceberg, the Mariana Trench and the Moon. 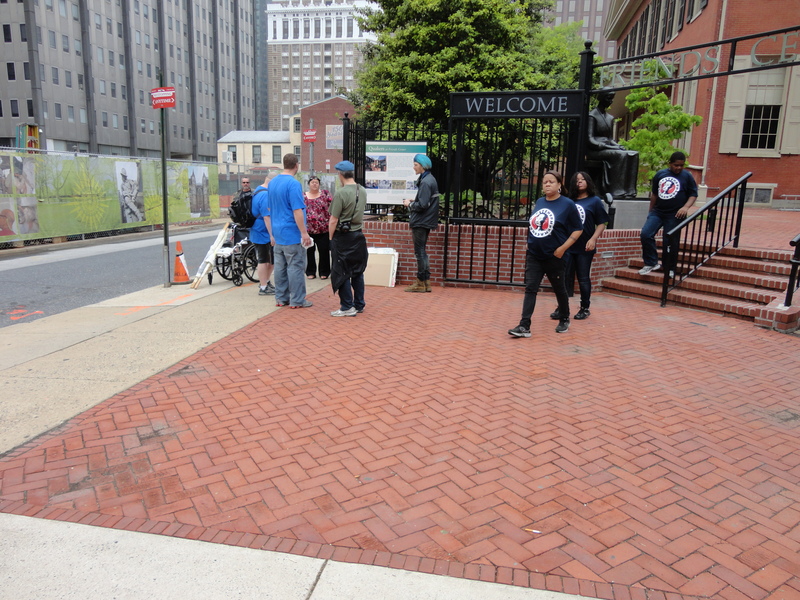 If you will note, G.M., this blog entry was mostly uploaded pictures from the Occupy the APA Counter Celebration and Protest that took place in Philadelphia on May 5, 2012. This is a space where we really shouldn’t get bogged down in discussing matters that are completely irrelevant to the event that took place on 5/5/2011. Our digressive dialogue began after a reader made a comment suggesting you supported forced treatment. I couldn’t help but agree with that reader. Your comments have been none too clear on the subject. If you have anything further to say on the subject could you please connect what you say with the rally and demonstration that took place on May 5th in Philadelphia. 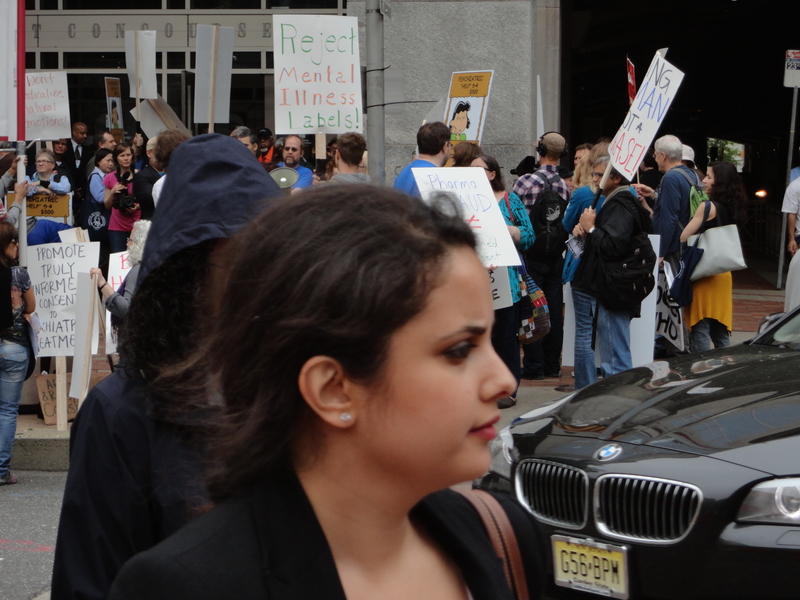 We were protesting the very real harm done to people through psychiatric labeling. The APA is currently revising its label bible, the DSM, and this revision is certainly likely to cause more harm to more folk. People come to this page to share a little of the excitement and the energy that took place at that rally and protest. 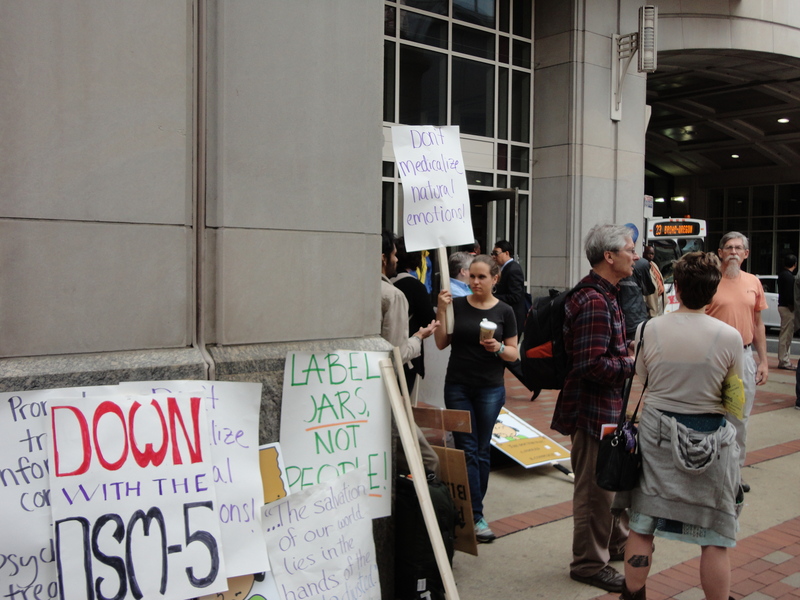 When it comes to Occupy the APA, let’s see a little of that enthusiasm and solidarity! Yay! Let’s not be party poopers! I am not going to debate the nature of hallucinations with you. I am not, in this space, going to be argumentative. Should you continue this unpleasantness, I will delete any comment you submit. I hope I have made myself clear. When you claim to believe in the right of an individual to be different you ought to practice this. Please do not make accusations and expect me not to respond. Please do not attack me for asking the questions that need answering in order for change to occur. If you believe in freedom of speech, believe in mine. I shall say again how great it was to see the photographs. I found it emotive to see everyone at the demonstration and felt frustrated that I could not be there or be involved in some way. I particularly admire Godly Mathew and have been reading his story. 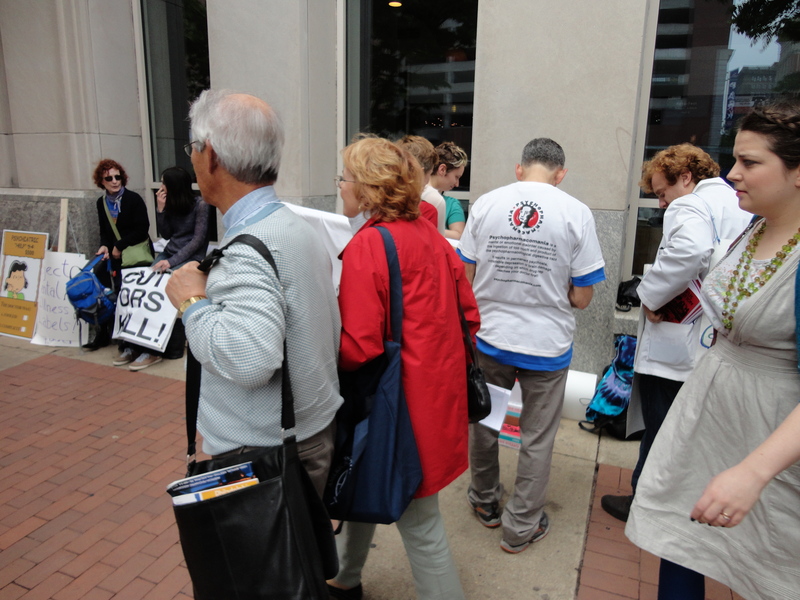 His personal demonstration was courageous and the way he handled his experience when in that dreadful hospital was too. I could not have done that personally and would probably have ended up being in there permanently. He tells his story simply and it has the ring of truth to it because of the familiar observations he makes about the way the police then the staff treated him. It is a game to so many of them and they get a kick out of being cruel. First contact for people involuntarily committed is no different from an arrest and that is traumatic in itself. The place Godly was taken to should be run like the respite centres we talk about. Instead it is run like a holding pen for prisoners. There is a great interview with Godly by Phillygrrl if you haven’t read it already. From: Process for Involuntary Emergency Examination and Treatment (a 302 commitment). It ought to be the case that this protects people from harm. It is human nature that causes the problems. In reality, anyone behaving outside of the social expectations of those close to them is vulnerable should those people turn on them. I wonder how many people are “informed of the reasons for the emergency examination” upon arrival and I wonder how many of them get those calls. Indicia: Signs; indications. Circumstances that point to the existence of a given fact as probable, but not certain. MFV, should you choose to use your power to silence me again, take a moment to compare yourself to those who use their power to silence us all. Power corrupts so quickly, you see. Even just a little bit. We are on the same team, so quit sidelining me. 2 strikes and a base hit. Pretty good. I’m allowing this comment, G. M., because it is on topic. 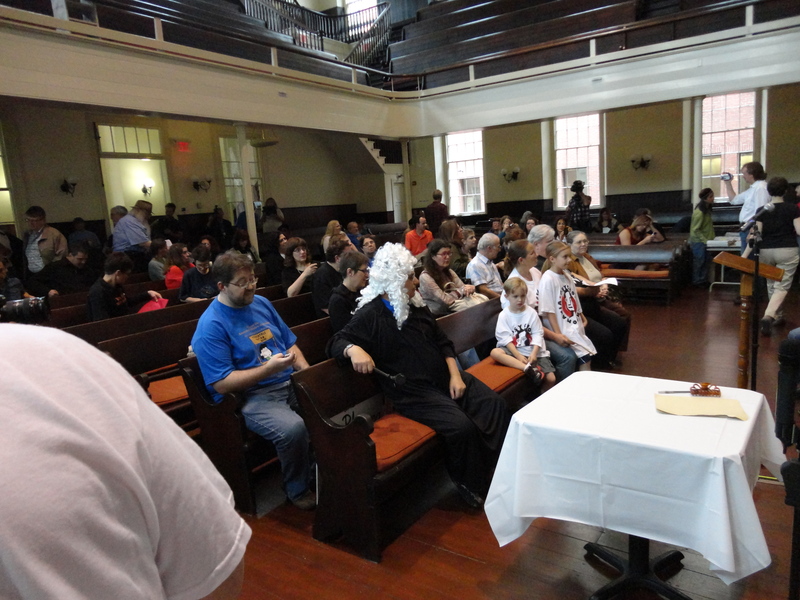 I would prefer to have comments under this caption relate to the event in Philadelphia on 5/05/12, and since the previous comments were not going in that direction, they were deleted. I believe in your freedom of speech to say anything you want to say on your own blog. I don’t believe in your freedom of speech to say anything you want to say on my blog. It is important to remember who is the host, and who is the guest, in dealing with any communication media exchange, and to treat people with the respect they are due. This acknowledgement also involves a certain amount of comprehending what they are trying to say to you. Thank you for coming back to the subject of the protest pictures. I hope you did find the pictures energizing and inspiring. Godly had a page on the MFI website once when his protest was in full swing. I have seen some of the other pages on web related to his experience. Godly was there, and I finally got the chance to meet him in person. He was there with a great many other people, each of whom had a story to tell, and a role to play, in bringing this moment to fruition. Stay tuned. The DSM-5 isn’t going to be out until 2013. This release will undoubted come with the APA convention in San Francisco in May of that year. 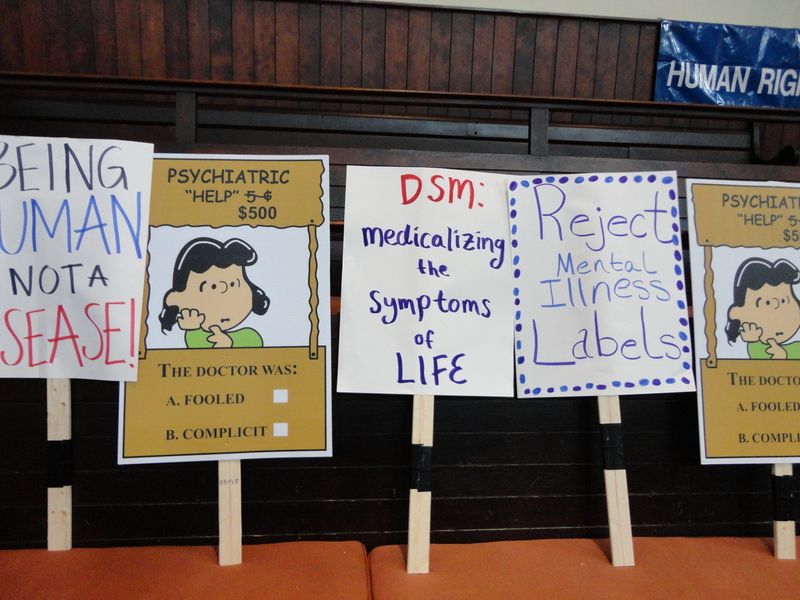 The DSM-5 is likely to mean more labeling, more harm, and more protests. We can’t hold a wait and see attitude when we are engaged in doing something about the matter. We, as a group, have had to take the plunge into direct action. Oh what joy to be back in the fold.. It is hardly egalitarian to provoke then censor response. I try to extend freedom of speech without caveat personally but I have noted your comment. I think treating guests with respect is important too. I comprehend what is said; I would be grateful if all would try comprehending what I say before jumping to conclusions. You are welcome; I truly did. Well done to everyone involved and keep up the good work.